Members have endorsed the NSWNMA Public Health System (PHS) draft claim that aims to deliver a 2.5% pay rise and the extension of ratios into new specialty areas, as well as improvements in some hospitals. Voting closed on the claim on 1 March. As The Lamp goes to print 214 NSWNMA Branches in the public health system have voted in favour of the proposed claim. One branch voted no. There were 235 Branches eligible to vote. The vote rounded off months of consultation and discussion with members through surveys, branch meetings, discussion groups and focus groups. An important facet of the claim is the further advance of ratios, building on the historic win in the 2010 PHS pay and conditions campaign. The claim seeks to extend ratios into specialty areas such as paediatrics and neonatal intensive care units, the improvement of ratios in all hospitals to the same level as peer Group A, and a new mechanism to guarantee face-to-face, nurse-to-patient hours in community nursing. The NSWNMA will also seek a 2.5% pay increase so nurses and midwives wages’ keep pace with forecasted inflation. The claim also seeks a funding commitment for a further 275 full-time equivalent CNEs/CMCs working across seven days and all shifts. Other components of the claim include guaranteed nursing staff for patient specials, a change to a better system to calculate the occupancy of a ward or unit than the current “midnight census”, and protection of the nursing workforce skills mix. 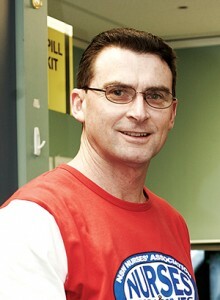 NSWNMA General Secretary Brett Holmes says the endorsement of the claim is encouraging and it is now time for nurses and midwives to take our message to a wider audience. “We now need to engage the public and enlist their support to win these improvements to public health in New South Wales. The implementation of ratios in the state has been a big success. That is consistent with the considerable amount of international research which shows more nurses leads to better patient outcomes. “We also need to engage our politicians. Ultimately they decide whether resources are provided to fund the necessary improvements. Merilyn Lambert, RN at POW ED.